After 107 years, you know that it's become the standard yearly reference for the night sky. 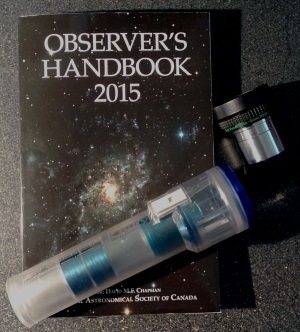 The Observer's Handbook is published annually by the Royal Astronomical Society of Canada. It's a printed, nearly pocket sized compilation of reference material for the amateur astronomer. Everything from basic data on terminology and symbols, to time zones and twilight. It covers the basics for optics and observing, sketching and digital photography. Eclipses, lunar observing, maps, and more. It contains information on observing the planets and satellites, dwarf and minor planbets. Meteors, Stars and the Deep Sky. There's even a basic set of star charts. There's so much material here, I really don't even know how to sum it up. You really need to see one of these to understand the sheer amount and depth of the material in the Observer's guides. Dozens of authors, all well respected and hundreds of pages of information that is of great value to the amateur. This book is the swiss army knife of reference books for amateur astronomy, and nearly as essential as a red flashlight and eyepieces. Just get one now and thank me later. In case you can't tell, it's very highly recommended. The 2014 version of the Royal Astronomical Society of Canada's Observer Handbook (now in it's 106th year of publication) has been out for a month or so. While the format and much material has been carried over from past years, there are several bits that are either new or revised. As one would expect, all of the date/specific pieces of information have been updated to reflect the new year while some articles have been revised significantly. Namely Telescope Parameters, Galaxies Nearest and Brightest, and Radio Astronomy with Radio Sources. In addition as has been the trend, you'll find some new content here as well. Two new articles: Observing Artificial Satellites by Paul D Maley, and Astronomical Precession by David G Turner and Roy L. Bishop both make their appearances. In addition you'll find a an article titled: Featured Constellation: Auriga by Chris Beckett. Also one should note, there are a (very) few articles (or tables) that no longer appear: Amateur Supernova Hunting, and the Table of Precession for Advancing 50 Years. While the purpose/general content of the book has not seen a major change observers who found the time specific data of use will certainly want to upgrade. Like it's predecessor, the 2014 RASC Observer's Handbook is a labor of love and should have a place on every serious amateurs bookshelf (or stowed away in the backseat of your truck). BTW - If the the Observer's Handbook is new to you or you're wondering what the fuss is all about, then you might want to continue on to read my post on last year's handbook. If you’re looking for a must have astronomical reference for the upcoming year, look no further than the Royal Astronomical Society of Canada’s Observer’s Handbook. Now in it’s 105th year of publication (yeah, you read that right), it’s long been regarded as the standard annual sky reference. Wondering when twilight ends? Astronomical, Civilian or Nautical? Curious as to when the moon will set next Thursday? What to know what eclipses and transits are coming up? What constellation to look for Ceres in? Hint – it’s visible in the first part of this year. When the best meteor showers of the year are going to be (and specific times and moon phases for each? ), got a hankering to know where IO is tonight? Or just want to know what events are happening this month? You’ll find this data, and much much more inside. Don’t think that it’s only good for one year though – the book is really a bookshelf reference for both time variate and invariate data. Featuring articles from Jay Anderson on the Frequency of Nighttime Cloud Cover (unfortunately only for April/May and July/August) to Alan Whitman on Southern Hemisphere Splendors, you’ll find topics ranging through nearly every aspect of amateur astronomy, along with basic moon and sky maps. While the nature of the book tends to mean that these are not in-depth end all explanation for topics like astrophotography, these short informative articles provide a good starting point often with follow up references. It’s also of great assistance to those of us who like working through observing lists. A sampling shows that Alan Dyer provides a couple of great references for the Messiers (like a seasonal listing) and his article The Finest NGC Objects is a great jumping off point for those who have already finished the Messiers, and are looking for something just a little different. If you’re looking for a real challenge, you might try Dyer and Ling’s Deep-Sky Challenge Objects. While they recommend a minimum aperture telescope, they also encourage observers to try with a smaller one. Paul Gray contributes a list of Dark Nebulae, Chris Beckett some Wide-Field Wonders, and David Levy a list of 154 Deep-Sky Gems. You’ll also find moon rise and set times, occultation maps, as well as a map of North American impact sites. Honestly it’s impossible to detail the level of data available in this book. In the age of smartphones, there’s a tendency to assume we already have this information at our fingertips (via apps or the internet), and while we do have a lot of it there for the calling (um, so to speak), there are some major advantages to having it all compiled into a handy printed reference. Books never run out of battery, and they don’t tend to ruin your night vision like an electric device. Oh, and all the books I’ve had over the years I have yet to experience one that randomly crashes or reboots. On the other hand, there are some advantages to e-book, and it would be wonderful to have a copy of this on my phone. Perhaps next year. Perfect for your bathroom, study the observatory or just to store in the center console of your truck, the Observer’s Handbook is a one of a kind resource that every amateur should have at their fingertips. My recommendation? Just get it. And sooner rather than later.